Early last year, at the University of California San Diego (UCSD), noticeably pale yellow fruit flies darted around their plastic homes inside of a genetics laboratory. These were no ordinary flies: each one carried a gene that made it a particular shade of yellow not commonly found in fruit flies. The gene was inserted by scientists with a “gene drive,” a new technology first published by scientists at Harvard University that short-circuits an organism’s normal method of inheritance. 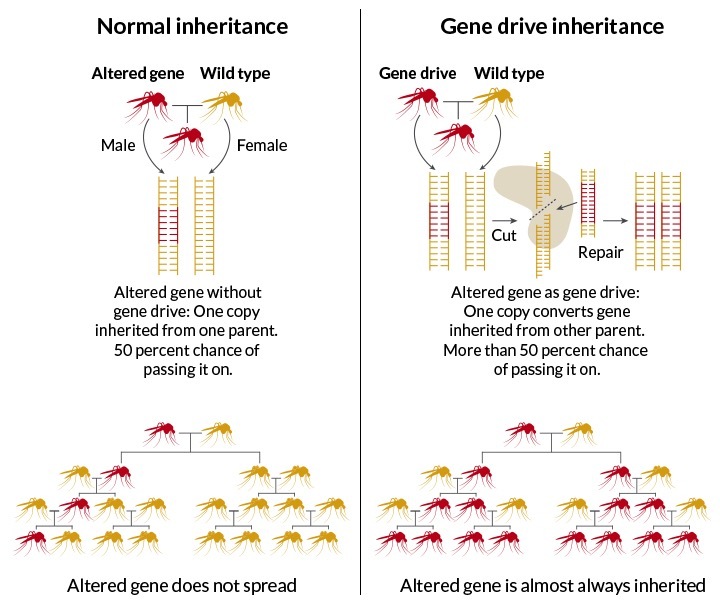 While genes in un-altered sexually reproducing organisms (like humans) have a 50% chance of being inherited by an individual’s offspring, gene drives allow the insertion of new genes that are then inherited almost 100% of the time (see the diagram below). Just one month after the yellow fruit fly research was published, an opinion piece in Nature called for tighter regulation of gene drive research. The authors were responding, in part, to the yellow fruit flies in southern California. The researchers at UCSD genetically modified a species of fruit flies in the lab that were also present in local ecosystems, leading many outside observers to imagine a nightmare scenario of accidental release before the impacts of gene drive technology are fully understood. Gene drives do more than just turn fruit flies yellow. They are powerful enough to allow scientists to insert virtually any known gene into a genome. These genes could possibly undo pesticide resistance in agricultural pests, make disease-carrying vectors like mosquitos unable to infect other species, make flowers smell better, or confer almost any other heritable trait by swapping out a piece of the target organism’s DNA. The ease of inserting gene drives is facilitated by a genetic technology called CIRSPR/Cas-9. CRISPR/Cas9 is essentially a tag-team of naturally occurring enzymes coopted by biologists that will cut DNA at pre-programmed sites, excise existing genetic code and insert new DNA. It allows for extremely accurate gene editing at low cost (check out this excellent video for further explanation). The technique is so elegant and at the same time so cheap that, in theory, almost any research lab can use it. Gene drives have received notable press over the past six months with some excellent descriptions of the technology in Science News and The New York Times. A figure depicting how a gene drive will be inherited 100% of the time instead of 50% of the time, as is normally seen in nature. While gene drives could bring potentially boundless beneficial applications, they could also be the agent of equally dramatic unforeseen consequences. The technique bypasses normal evolutionary processes and leads to the introduced gene spreading through a wild population. There are two main concerns with gene drives. The first is that the genetic alteration could negatively impact ecosystems. Changes to species could have effects that cascade through ecosystems in ways we are unlikely to be able to predict or understand. The physical piece of altered DNA will not be what causes ecological harm—it is instead the way that the DNA might change the behavior, diet, and chemical role of the target species that could cause problems. The second concern is that altered genes could spread to other organisms. Right now there is no institution domestically or internationally that oversees gene drive research, field trials, and implementation. Almost everyone agrees that this is a problem that must be addressed with care and urgency, but nobody yet knows exactly how. How can we fill the regulatory vacuum that now exists? Who decides which labs can carry out the research and who decides when and where field trials take place? I posed these questions to Dr. Ken Oye, a professor at the Massachusetts Institute of Technology and the lead author of a 2014 Science article that outlined the regulatory challenges of developing gene drive technologies. Unfortunately he could not provide the clarity one might hope for: “Those are good questions and right now there are no answers.” To Oye, the institutional issue is a massive one. “We’re in an awkward place because there’s no clear authority to turn to,” he says. For now, we’re left with a series of “what if” questions. What if a crop pest that contains a gene drive to remove its pesticide resistance changes its pollination behavior and impacts agriculture? 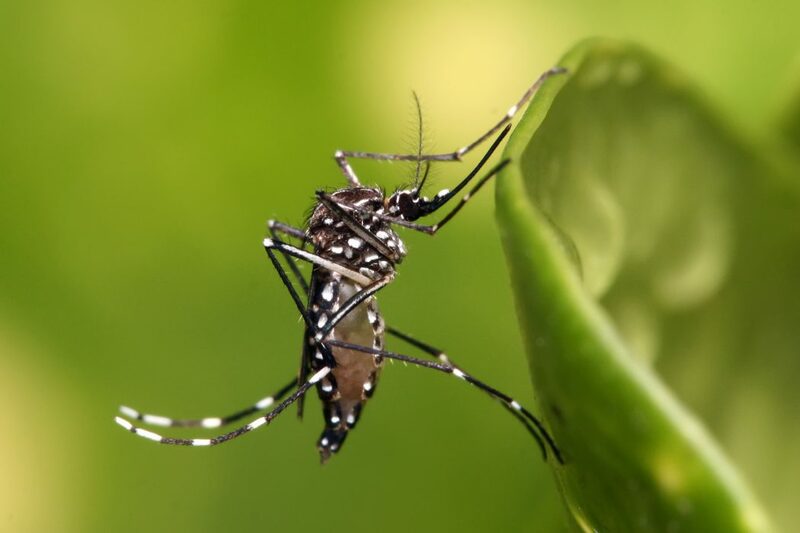 What if an altered mosquito no longer carries Zika virus but also becomes more tolerant of new environments in an unforeseen effect of a changed immune system? To answer any of these questions, a full ecosystem-scale study is necessary, and such a study is likely impossible without a controlled release of organisms containing gene drives into a setting outside of the lab. This brings us back to the crucial questions: Who is trusted with this research? What applications are acceptable? When do we decide lab development has progressed far enough to allow for release into the wild? Where do we allow such research or releases to take place? How are these decisions made? This last question is the biggest: Who is in charge? The good news is that media attention and concern in the scientific and policy communities over this technology has led to a National Academy of Science working group that met last December. A report from this group should be made available sometime in the coming months. When it is, hopefully we’ll be closer to understanding the Who, What, When, Where, and How of gene drive regulation. Images courtesy of Wikimedia Commons and Science News, respectively. Ellie Bors is a PhD candidate in the MIT - Woods Hole Oceanographic Institution Joint Program in Oceanography. She currently studies the evolutionary genetics of marine animals, with a specific focus on invasive marine species. She is also pursuing a certificate in Science, Technology, and Policy from MIT, and is broadly interested in marine resource and biodiversity management. Outside the lab, Ellie enjoys playing her cello, known affectionately as Zoltan.